Click here to order the Oyaide R1 online! Oyaide- Designed for purity and clean, integrated Structure. Importance of a quality power supply connection is widely accepted today. Many enthusiasts set up dedicated lines exclusively for their audio system, so the quality of the AC Receptacle cannot be ignored. Conventional "hospital grade" receptacles can improve the security of contact, but for the sound quality, they are far from perfect. Oyaide developed the R1 specifically for audio components. The Oyaide R1 is totally non-magnetic in order to minimize potential disturbances from magnetic fields. Base Material of the Oyaide R1 - Highly (twice) polished Beryllium Copper base metal, plated with platinum, and then the R1 is finished with palladium plating. The R1 Mounting Bracket - 24k gold plated Brass fittings for strength and durability. The Oyaide R1 Body | Insulator - glass filled Nylon for high rigidity, resonance absorption and safe insulation. Notes: The Oyaide R1 is a 20 amp AC receptacle. The blade configuration for cables mating to the R1 may be either 15A standard with two vertical blades + ground blade or 20A with one horizontal blade and one vertical blade, along with a ground. DO NOT USE THE R1 WITH MALE 20A CONNECTORS unless your circuit is indeed rated for 20A. 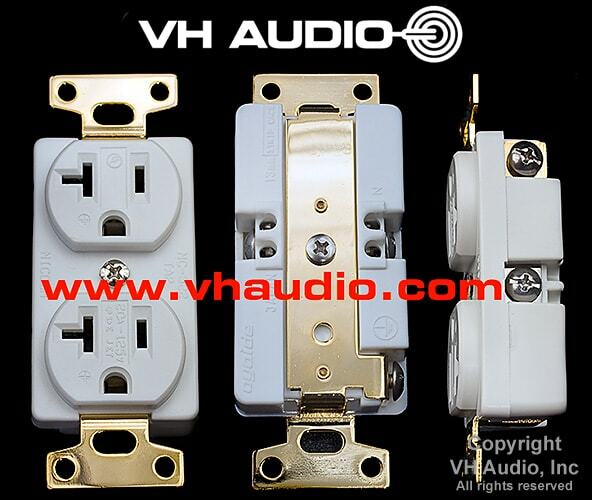 All Oyaide R1 receptacles from VH Audio are deep cryogenically treated, and are available with (optional) 6 day conditioning on a cable cooker.